If you had told me that one day I will be posting neem begun recipe, I wouldn't have believed you. I wasn't a big fan of this recipe. I still vividly remember the big neem tree in front of our house growing up. 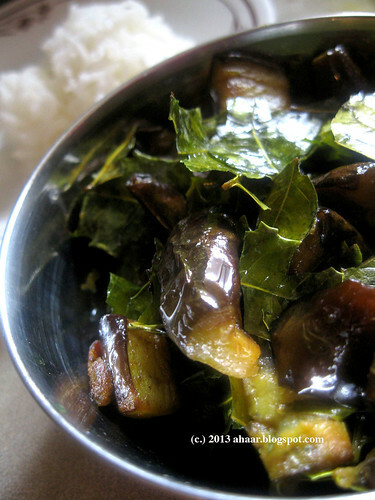 Every spring, my mom would ask someone to cut some tender leaves of neem (margosa, Azadirachta indica) and saute them with eggplants. We would try to get out of eating them. My mother would insist that we try some. "It is antibacterial and antifungal." Or "You wouldn't get chicken pox if you eat it," she said as she tried to coax us to take a few bites. We would and make faces as the bitter juices escaped and mixed with the rice and soft eggplants and then would quickly gulp it down. Fast forward to last week when I found some leaves in the Indian store. I picked some up and brought it home. And double checked with my parents, because I was so surprised to find them here for the first time! The leaves were not so tender, but fresh enough. "What perfect timing," I thought, "just in time for spring cleaning!" So this spring, we are doing an internal cleaning as well with some bitter neem or margosa leaves. For the little ones, I boiled some leaves in water for a bath. And for us, I recreated my childhood recipe of neem begun. 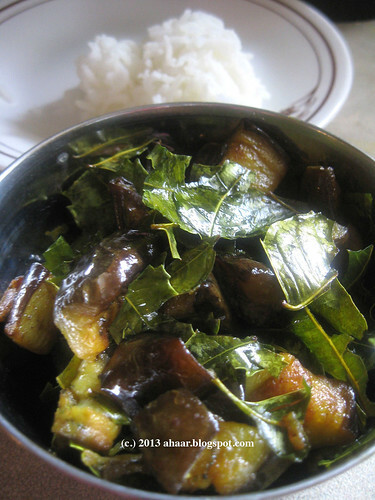 Chop the eggplant in small cubes, rub some salt and turmeric and set it aside.Tear the leaves and keep it aside. Heat a pan with half the oil and saute the leaves with some turmeric and salt on low medium heat. Take it out. Add some more oil and saute the eggplants till they start to turn soft. Once the eggplant is almost done, add in the neem leaves and cover it. It is typically the first course and tastes best when mixed in with some rice. It is also said to increase appetite too along with all the other medicinal properties. 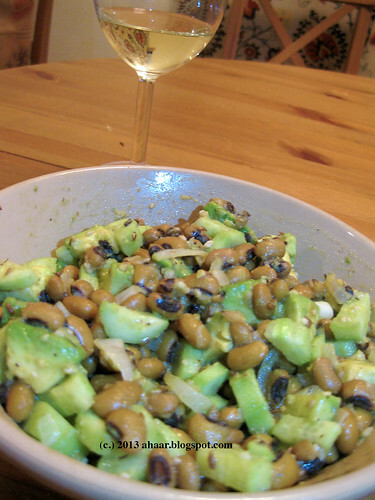 Why is it that I have never blogged a black eyed peas recipe before, I scratch my head thinking and yet I can come up with no answer. It's not that I don't make it. I make it often, almost every week sometimes. And somehow I have never photographed it or written down the recipe. Has it ever happened to you dear friends that you have a go-to recipe and you have never shared it before? Today, along with this familiar recipe I want to share the book I am reading. Wave by Sonali Deraniyagala. It's the most gut-wrenching book I have read. Wave's starting point is her experience of the tsunami where she loses her husband, her two sons and her parents and recounts her life thereafter. I have been reading it slowly in bits and snatches when I have time after putting my boys to sleep or early in the morning. And I am glad that I am reading it slowly because I don't think I would finish it otherwise. Her grief is raw, tangible almost and as NYTimes puts it "opens beneath you like a sinkhole." It's dark, angry and there are no clean endings here. But in between this dark anger and suicidal fury there is also love and happy memories of her life before. Why such stories matter? This is what Teju Cole says in the New Yorker review: "In witnessing something far-fetched, something brought out before us from the distant perimeter of human experience, we are in some way fortified for our own inevitable, if lesser, struggles." 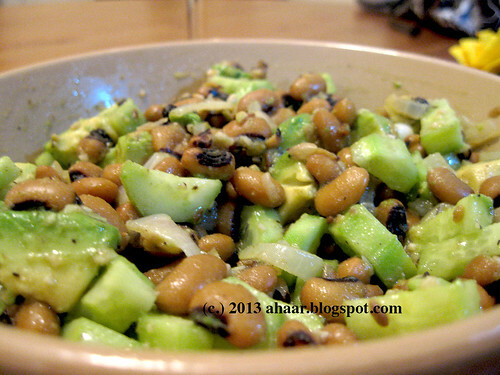 Here is the recipe of the Lobia/black eyed peas salad. Soak the lobia overnight in water and then boil it. Take half of it for the salad and reserve the rest for a curry for another day. 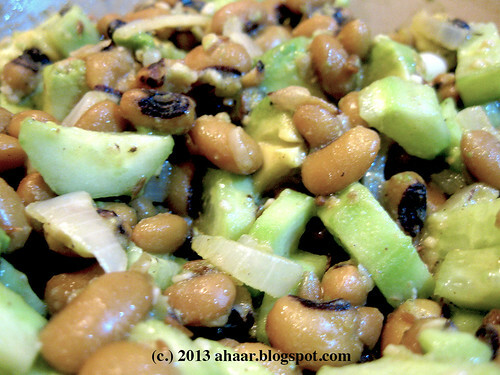 Put the lobia in a bowl and then add the rest of the ingredients - cucumber, avacado and onions. Add the lemon juice, black pepper, cumin powder, red chilli powder and salt. Mix it nicely. I just use my hands for the mixing. Serve as a side or a starter. It's a good with wine too! Sending this to MLLA 58 being hosted by Chez Cayenne. It was started by Susan and has now been taken over by Lisa. Aswin makes a mean frittata. He found the recipe about a year ago and has been tweaking it since then. 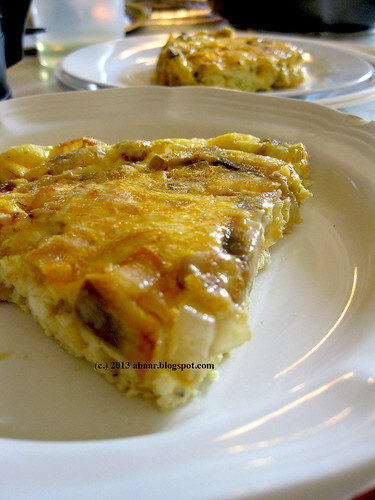 He has experimented with veggies, spices and even how long the frittata should cook. We've had it over weekends, taken it for brunches with friends and finally it has been given the green light to be posted. Now let me tell you how luxurious this frittata feels when you've had a chance to sleep for an extra 45 minutes without any kid demanding your attention. No constant "Mommy, wake up" calls from the older one or the little one wanting to be nursed. And then there is hot tea waiting with some Parle G. Yes, that's my favorite to dunk in tea anytime of the day! The house is smelling divine too. 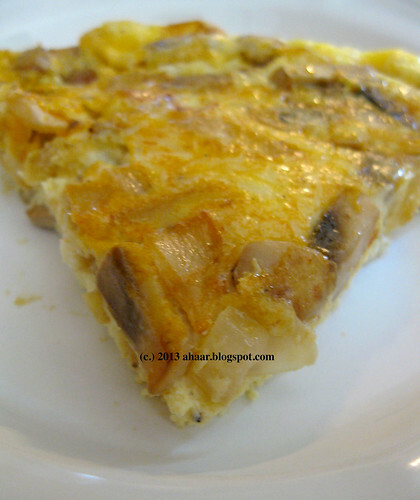 I ask and find there is a masala mushroom frittata in the oven. I take another sip of tea. Yes, this is what Sunday feels like! Heat the oven to 350 deg C. Butter a round 9inch pan. Heat a pan with the oil and saute the onion for a couple of minutes. Then add the mushroom and cook for another 2-3 minutes. Add in the spices, salt and the green chilli and let it cook for a minute long. Set it aside to cool. Break the eggs and whisk it. Now add in the milk, and salt and whisk till its fully combined. 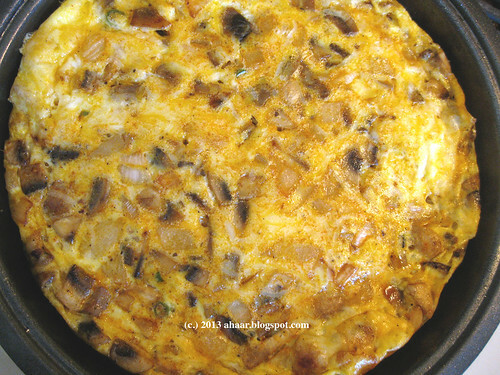 Transfer the mushroom and onion mix to the pan, and pour the egg mixture on top. Now add the cheese on top and it's ready to be baked. Put it in the oven and let it cook for 20-25 minutes depending on your oven. The frittata should be set.